Digital radiology (DR) may represent the top scientific breakthrough in medical imaging over the last ten years. The use of radiographic films in x-ray imaging might become obsolete in a few years, due to the superiority of digital radiology (DR). An appropriate comparison that is commonly understood is the replacement of standard film cameras with digital cameras. Images can be immediately acquired, deleted, modified, and subsequently sent to a network of computers, which is especially important in the medical field. The benefits from digital radiology (DR) are enormous. 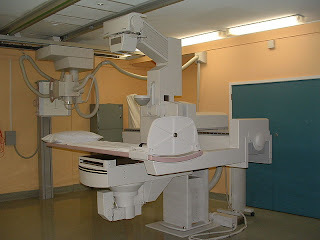 It can make a radiological clinic or department filmless. The referring physician can view the requested image on a desktop or a personal computer and often file a report just a few minutes after the examination was completed. The images are no longer held in a single location; but can be seen simultaneously by physicians who are miles apart. In addition, the patient can be given the x-ray images on a CD to take to another physician or hospital for consultation. Advantages of digital radiology (DR) include time efficiency, as a result of being able to do without the standard chemical processing, as well as the ability to digitally transfer and enhance images. Being able to enlarge and highlight images is of paramount importance in x-rays, and digital radiology (DR) gives physicians and technicians better diagnostic tools, as a result. Also, less radiation can be used to produce an image of similar contrast, which is very important, especially in children and adolescents for whom it is important to keep exposure to radiation at a minimum. MedWOW, the multilingual, global medical equipment marketplace, features medical device inventories from dealers all over the world, so locating the specific digital radiography system or add-on you need from a variety of makes, models and manufacturers in a safe and protected environment, is easy and secure. MedWOW is the leading medical equipment portal for all types of medical equipment trade, and with over 12,000 users visiting the site daily; locating your particular digital radiography system or upgrade is a hassle-free experience. MedWOW also provides free Escrow service, so you can be sure you are getting exactly what you pay for. Some of the digital radiography systems and add-ons currently available from imaging dealers throughout the world include: DIS Digital Radiography Upgrade Adapter #ezDR4000, RF System Digital Radiography Upgrade Adapter Naomi, DRTECH Digital Radiography Upgrade Adapter FLAATZ 330 and many more options.